Top-ranked Mill Valley will travel to Pittsburg in a key quarterfinal game in Class 5A. A year later, the 2015 Jaguars are 9-1 and have been ranked No. 1 since beating 5A pre-season favorite St. Thomas Aquinas 38-20 to open the season. 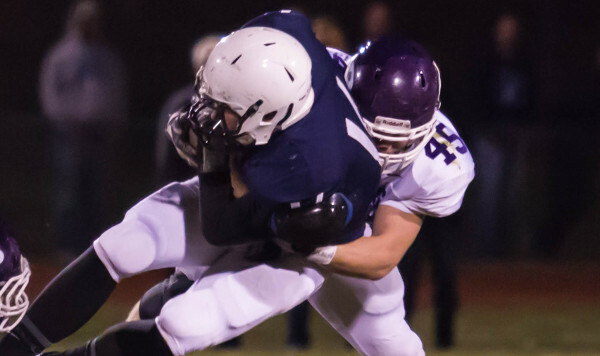 Mill Valley survived a brutal schedule that included wins over six playoff teams. Their only loss came 28-21 to Staley (Mo. ), a team that ascended to No. 1 in the Missouri Class 5 rankings before completing a 9-2 season with a loss in the state quarterfinals. The Jaguars are led by senior quarterback Logan Koch. Koch (6-0, 200) has completed 68 percent of his passes for 1,844 yards and 25 touchdowns while only throwing four interceptions. He remains a dangerous threat to run the ball as well. Koch has rushed for 581 yards and has scored a team-high nine rushing touchdowns. Sophomore Ike Valencia is second on the team in rushing with 536 yards and five scores, while Christian Jegen has 426 rushing yards and eight touchdowns. Junior back Tristan Milne, a primary ball carrier, was injured in the Week 7 win over St. James Academy and has not returned. Jegen (6-2, 200) is a dynamic playmaker who has more than 1,000 career rushing yards, nearly 2,200 career receiving yards and a combined 44 touchdowns. This season, Jegen has 50 receptions for 941 yards and 11 scores. Lucas Krull (6-7, 215) has 39 receptions for 567 yards and 10 touchdowns. The Jaguar defense is led by senior Cole Morris (6-4, 210) who has 61 tackles including 21 for loss and nine sacks. Senior Seth Burnett leads the team with 89 stops. After graduating Barnes, Pittsburg got the benefit of Sherrick Rogers return to the team after spending his junior year as an all-state receiver for Eight-Man, Division II Chetopa. This season, Rogers (6-1, 185) has rushed for 1,142 yards and 18 touchdowns on only 93 carries, an average of 12.3 yards per carry. Senior quarterback Spencer Turnbull directs the Purple Dragon offense. Turnbull has thrown for 989 yards and 11 touchdowns and added 345 rushing yards and six scores. Full back Dante Menghini has rushed for 599 yards and eight scores. Pittsburg has plenty of speed at the skill positions to keep up with the Jaguars, but the Dragons must match Mill Valley in the trenches in order to advance. This is a rematch from a Week 3 contest won by Eisenhower 29-20. The game, coupled with a 26-25 victory against Andover in the season opener, announced the Tigers as a 5A presence. Maize South won the yardage battle, 301-244, but had five drives halted inside the Eisenhower 20-yard line. The Tigers also had an 87-yard interception return for a touchdown. Maize South had its kicker hurt in the contest. Eisenhower has already made history in its third season of existence with its first playoff victory, a 20-14 upset win at Kapaun Mount Carmel. Eisenhower was 2-7 in each of its first two seasons. Maize South has been a consistent playoff team in coach Brent Pfeifer’s six years and is now 3-5 in the postseason. A win Friday marks the Mavericks’ first sub-state appearance. Maize South won at surprising Great Bend, 26-14, in the first round. Eisenhower has scored 25.2 points and allowed 25.5 points a contest, a rare quarterfinalist that’s been outscored for the season. Last year, Eisenhower scored 15.3 points a game and permitted 30.9 per contest. In its first year, Eisenhower tallied 13.9 points a contest and allowed 26 a game. Quarterback Mason Madzey has keyed the offensive improvement for an experienced team. Maize South, known more for defense under Pfeifer, has averaged 34.6 points and permitted 25.2 a contest. Last season, the Mavs tallied 26.7 points per game and permitted 19.6. Senior standout quarterback Korie Frausto has 1,585 rushing yards. Maize South had four turnovers versus Great Bend – a squad known for big defensive plays – though Frausto accounted for three touchdowns. He accounted for 192 rushing and 73 passing. Jordan Maxson collected 15 carries for 89 yards and a score. Frausto and Rossville’s Tucker Horak are Kansas’ best dual-threat players. As long as the Mavericks stay away from turnovers, they should win.